I don't know, but my question about that would be, are there a number of instances where you've seen that, or just once? If just once, it could be an oversight, faulty pen...? If it's a number of places, it could be an identifier. 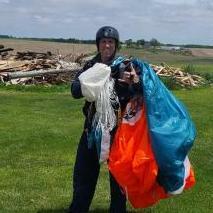 Skydive Chicago is hosting its annual Memorial Day Boogie on May 25-May 27. This weekend marks the beginning of our peak season and kicks off the many events we have in store for the 2019 season.Throughout the holiday weekend we are offering tandem skydives at only $189 per person. *Advanced reservations are required to qualify for discounts.This is also the official opening of the Tiki Hut! Stable freefall and clean openings have nothing to do with what canopy size is right for you. Based on your history, a 150 at 1.25 wingloading would probably be just fine as far as landings are concerned, depending on the type of main you are flying. As mentioned above the issue of traffic, especially in the pattern, is different than you are used to. Think about how will you react if someone is doing a downwind final at the same time you are on final into the wind or if the jumper in front of you is flying a larger slower canopy than you and you are overtaking them on your base leg or if someone cuts you off on final or if someone opens close to you and is flying right at you just as you are opening... There are many situations like these in which flying a larger slower canopy when you have little experience flying around other people is a good thing. Always consider worst case scenarios when deciding what wingloading is right for you. Have you thought about your reserve size? You are used to flying a nine cell at a higher wingloading, but have you ever jumped a 7 cell at a higher wingloading (or at all)? Having never jumped one, would you like to land one at 1.25 into someone's backyard (or whatever area with lots of obstacles) at sunset because the spot sucked and you had a mal? More square footage equals slower landing speeds equals a better chance of walking away from a worst case scenario. Regardless, make a point to take a canopy control course as soon as you can after you get off student status, preferably before you buy anything. Probably seems silly considering your experience, but I can guarantee that you will learn something about how to safely fly in traffic and how to avoid canopy collisions (which kill skydivers way too often). If your instructors feel that you aren't ready for a 150 yet, listen to them. They know more about skydiving than you do and they aren't trying to hold you back. They only have the safety of you and everyone you will be jumping with in mind.